Finally winter has returned and we’re back in the minuses. In years from now when people talk of Janathon 2012, will it be remembered as the “easy one”? Certainly compared to the conditions last year we have got off lightly but does that make it any easier to get out and run everyday. There is no doubt that when it is cold or wet outside it is easier to stay indoors but if you’re in the right kit, going out running when everyone else is tucked up inside can be liberating. You get far more of a sense of isolation and challenging conditions will often give you something more to think about than just how much your legs hurt or what you’re going to blog about. Genius hey! Goodness knows how long he spent trying to squeeze the word Janathon into the city streets. It would have looked brilliant on the Garmin if my battery had not died en route to the start point. I think there must be something wrong with it. Despite charging to 100% overnight, minutes after latching on to the nearest satellite it died. You can imagine my disappointment given the efforts Tom had gone to in designing today’s route. I would have felt quite a fraud logging my final Janathon route manually if it was not for the fact that I ran accompanied. Tom’s route started at the back of the Royal Court’s of Justice and each with a map in hand we navigated our way east spelling out the letters of Janathon. Many of the letters required us to head one way and then double back on ourselves. The regular change in direction was a relief given the cold wind that was blowing. Notwithstanding the number of heavily wrapped pedestrians heading out to get their lunch, we were covering the ground quickly. The month’s previous miles and associated aches/pains were soon forgotten as I chased down the finishing tape, ably paced round by Tom. Over Holborn Viaduct it was down on to Farringdon Road and towards St Pauls and then on from there to the Bank of England. A doughnut around the Bank and we were off up towards the London Wall and our final letter. At the junction between Leadenhall and Bishopgate we celebrated my 300th Janathon mile. Clock stopped, we covered 5.5miles in just over 38 minutes. With a sustained 7min/mile pace (my fastest of Janathon), it would seem I am well on track to realise my 2012 goal of running the Fleet Half in March in 1hr 35mins. Whilst not a PB, I will hopefully be completing the half 10 minutes quicker than I would have been without so many miles under my belt. Janathon would not have been possible without the love and support of my family and friends. Particular thanks has to go to Mrs B for her unquestioning belief in me and continuous encouragement and understanding as I sacrificed precious time with her and the little widger to get in the miles. I am also very grateful to best friends John, Tom and Goose for taking me out on runs and inspiring me to push harder. Special thanks also has to go to everybody who has read my blog and left such supportive comments. Finally, thank you to the organisers of Janathon for running this special event. You’ve helped put running back into my working day. Litte widgertron celebrates the end of January! After 28 miles of trail running over the weekend, it seemed prudent to throw in a recovery run today. I’ve never been quite sure what the purpose of a recovery run is. I would like to think that my legs would have thanked me more if I had not run at all but alas that was not an option. It will be in a couple of days. Hooray! So I guess recovery means you run a bit slower and over a shorter difference. The difficulty is that my legs now only appear to have one speed: a Janathon speed. This basically means covering the distance as quickly and comfortably as possible. I would like to think that in a couple of week’s time, after some good rest, the time put in during January on road and trail will pay dividends in terms of increased speed and stamina. At the very least, the 3kgs I have lost and the reduced body fat will mean I am lighter on my feet. We will see. Anyhow, I set off at a slow and steady pace for my final Janathon visit to Hyde Park. I’ve really come to enjoy my runs out to this City oasis. The plethora of paths that criss cross the park mean you never run the same route twice. There is also plenty of space and amusing sights to cause sufficient distractions on a long run. 6. Finally the amount of running kit that needs to be washed has quadrupled my washing machine usage. So if anything, Janathon has increased my carbon footprint. Best I go and plant a tree. Today I “recovered” for 7.4miles around Hyde Park in a smidge over an hour at a 8min/mile pace which brings my Janathon total up to 295miles. Tom P has lined up something fun tomorrow to make up the final five. My blog this evening is going to have to be short and sweet. This is by no means a reflection of the quality of today’s run or the company of those I ran it in but it is late, I’m tired and I have been stuffed to the gills with gourmet food cooked first by Mrs Local-Adventures and secondly by my mother-in-law. As my stomach is going into overdrive to digest two fabulous meals, it is proving difficult to keep my eyes open. On top of this, when I am finished blogging, I’m going to have to prep my running kit for the penultimate day of Janathon. Today I had the pleasure of running with great friends Tom P and Goose (http://goosevallance.blogspot.com/). This was my fourth accompanied run of Janathon and first with Goose. Last year I joined him on a couple of runs in a month where he notched up an incredible 450 miles. It was the guilt of not running everyday like Goose which inspired me to enter Janathon this year. As we were starting out from Goose’s house in Upper Hale, he kindly agreed to set our route and nav us around. Our very own Local-Adventure if you like. Leaving his we headed up into the back of Caesar’s Camp for a mile or two before crossing the A287 and down the otherside on to Old Park Lane and into Farnham through the art cottage. About four miles in, our obstinate sausages were starting to warm up whilst Tom was as fresh as a daisy. What followed was a master piece of navigation as Goose threaded us through the centre of Farnham via a network of single track which ran between the houses. We were soon into Bourne Wood and skirting round woodland which had previously doubled as film set for the first scene of Gladiator and more recently Robin Hood. More trail followed as we crossed over the Wey and followed it’s course along a lane popular with green laners. Just over an hour in, Tom P started picking up the pace. Spurred on by the threat of divorce if he was late for a family lunch our speed increased as we cut through the picturesque village of Telford and back on to trail that would take us back towards Farnham, following the route of the Lower Wey. After 30 minutes of sustained pace, it’s fair to say that I was on my chinstrap. The miles the day before had taken a toll on my energy levels and I started to flag. The only way to complete the run was to dial back the pace a little. A novel cut through under the A31 and we were at the Shepherd & Flock roundabout. I now knew we were on the home straights. As Tom gained his bearings, he was able to push on leaving Goose and I to finish our run tired, but heads held high. It had been a great route and one I would love to return to on fresh legs. A quick shower and we were able to join our wives and widgelets for well deserved fish pie. Thank you Mr and Mrs Local-Adventures. Today, I was dragged 14.7 miles in 2hrs 7mins giving me a Janathon total of 287 miles. Looking good for 300. A school boy error meant that my run today was delayed by two precious hours. I had failed to charge my Garmin. Normally I charge it overnight but last night it said it was at 75%. I therefore assumed that it would have enough juice to get me round today’s run. Wrong! I had accidentally left the GPS on and the battery was drained. What should have been a 3pm departure turned into just after 5pm. Although the nights are getting lighter, a 5pm atart still meant that I would be pretty much running today’s Janathon quota in the dark and my trusty Ay-Ups would be required. Whilst a Petzl is more than adequate, the Ay-Ups rock. I use the wide beam lamps for running and it is like being in daylight. 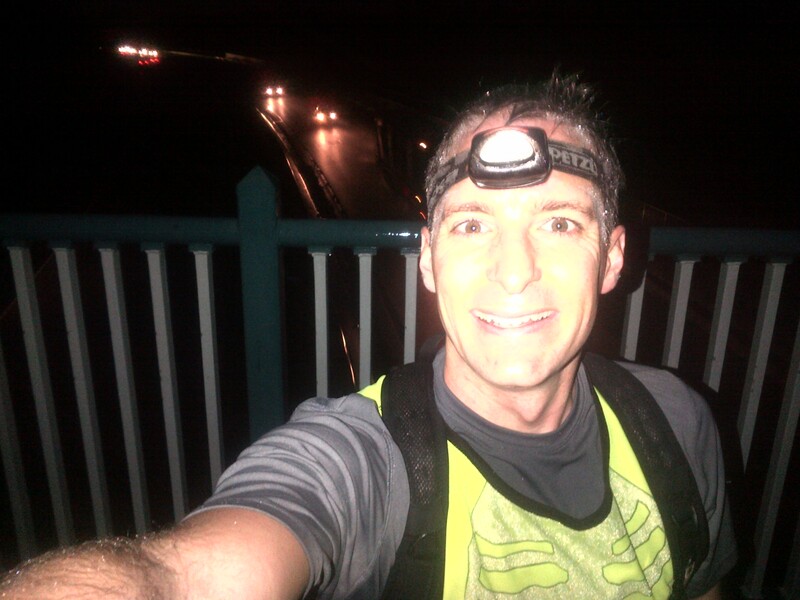 They are so bright, when you are running it feels like a car is behind you with its full beams on. It is true what they say, a watched Garmin never charges. Who would have thought it could take 2hrs to get just a 23% charge on a watch. I guess I could have run without but this far into Janathon I take a lot of comfort from knowing what distance I have covered at any given moment. Not that I look at it often but it is nice to check the distance and pace once in a while and calculate how far I have still got to go or if I am meeting my own expectations for the run. There is also something satisfying about uploading the data on the Running For Free website. Also, when you are running on trails, it gives you a far more accurate record of where you have been than using G-Map pedometer which is best suited for roads. So you can imagine my enthusiasm for running by the time my Garmin was finally sufficiently charged. I was already dressed for running when I discovered that it needed charging. Languishing around the house in the warmth for a couple of hours did nothing for my motivation. I’m fine if I get my shoes on and go but today I had more than sufficient time to talk myself out of it. The beauty of Janathon is that not going running is not an option. When I did finally get out the house it was a relief. Although I was not convinced that my Garmin was sufficiently charged I couldn’t wait any longer. Today I headed back out towards my favourite stomping ground of Caesar’s Camp via the canal. Only half a mile in and my watch beeped to tell me that the battery was low. I crossed my fingers it would hold out and pushed on skirting round Rushmoor Arena. Entering Caesar’s Camp it beeped again. All I could think was how much energy the watch would save if it didn’t beep. Assuming I only had a few minutes left before it died, I didn’t hang around and kept to the main trails so that if it did die, I could easily track my route on G-Map. As I left Caesar’s Camp my watch was still working. Heading back into the back of Fleet Pond I decided that if it still worked at the junction to home, I would push on round Fleet Pond to take in an extra mile. Although it had by now beeped four times to warn me the battery was low, it was still working. It was only when I got home and was warming down outside that it finally gave up the ghost. I now know a 23% charged Garmin will last 1hr 55mins. The positive side to running off-road after dark is that it really feels like you are flying. The reality though was that I wasn’t. But still, I did manage to cover 13.37 miles in 1hour 49mins which was plenty enough for today. My Janathon total now stands at 272 miles. Mental to note to self, charge the Garmin every night in order to avoid run delays. Worse than morning runs is heading out to put in the miles on a Friday evening. No more so than at the end of a tough week when you want nothing more than a cold beer and time with the family. Unfortunately today there was no alternative. Once again the bed magnets were too strong and the alarm was turned off not put to snooze. When I did finally wake, quick maths ruled out the possibility of a meaningful run before work and lunch was a no go due to meetings. Do you then head out before dinner or after? A no brainer. So for tonight’s run, I got off at Farnborough Station. Rather than follow the straight line route home, I decided to take in a loop around Farnborough and Cove. All roads familiar to me having spent the first 25 years of my life in the area. As I ran, I reflected on the week that had been and Janathon as a whole. I still continue to be amazed at the mild January we have been having. I have only twice had to wear leggings and that was not so much due to the temperature but a comfort blanket on long runs when inevitably I run slower. It was also good to know that I was heading into the weekend with more flexibility as to when I went running. It is wrong to say that midweek running is stressful but it does require far more planning and preparation. The good new is that this aspect has been refined during Janathon and the systems I now have in place to ensure I run lunchtimes or to and from work will stay with me. From Cove, I ducked under the railway into Southwood and took my now familiar route around the edge of Fleet Pond to the station. Having obtained clearance from Fighter Command for a slightly longer run this evening than on an ordinary school night, I took in a loop of Ancell’s Farm and then headed into Elvetham Heath. Rather than following the road all the way through to the main entry/exit, I took a footbridge over the main line and on to Elvetham Road. It was then back to the station via Stockton Avenue where I picked up my bike and headed home for tea and medals. Unfortunately the little widger was already asleep so my baby time will have to wait until morning. With the run from my office to Waterloo, today I have run 10.65 miles in 1hr 26mins 47secs giving me a Janathon total of 259miles. Commuters are a funny breed of people. I am sure outside of rush-hour everybody is perfectly decent but between 7 and 10am and 5 and 7pm Monday to Friday it is each for their own. What is it about heading to and from work which makes us act this way? 1. Absolutely no talking. However, a loud telephone conversation or I-Pod is acceptable unless in a quiet carriage. 2. All forms of chivalry is suspended during rush-hour. 3. Users of Brompton bikes are second class citizens. 4. It is perfectly acceptable to sit on an outside seat forcing people to ask “is the seat next to you free”. 5. The space under seats is fair game for rubbish and half read newspapers. 6. The person who touches the door open button is allowed to board first regardless of how long anybody else has been waiting. 7. If you leave something on the train, it is fair game for somebody else to claim it. On the odd occasion, these rules are broken but this usually requires the train to be delayed en route for at least at least two hours. Oddly enough, it is perfectly ok to talk on the first fast train of the day. Probably because commuting at this time is so extreme that there is a degree of brotherhood between the few that do. Likewise, between 8-10pm it is fine to eat unhindered what ever smelly food can be purchased from the station concourse, be it noodles, a burger or pasty. I am only prompted to make these observations because of how funny I found it yesterday to get on the train at Brookwood caked in mud with not one person batting an eyelid. In the years I have been commuting I have not seen one person get on the train in the same state. If I did, I like to think that I would stop and ask them what on earth they had been doing. Anyhow, random topic of conversation aside, a lunchtime lecture and a promise to be home by 7pm to babysit meant that another morning run was the order of the day. Despite my complaints early on in Janathon that I disliked early runs, there is something very satisfying about getting it done before breakfast. It reduces the pressure of having to head out later in the day and also there are very few disruptions between 7 and 9am. No one really expects you to answer the phone or send emails. Save for missing your alarm, there are no urgent meetings which can scupper your plans to run at lunch. 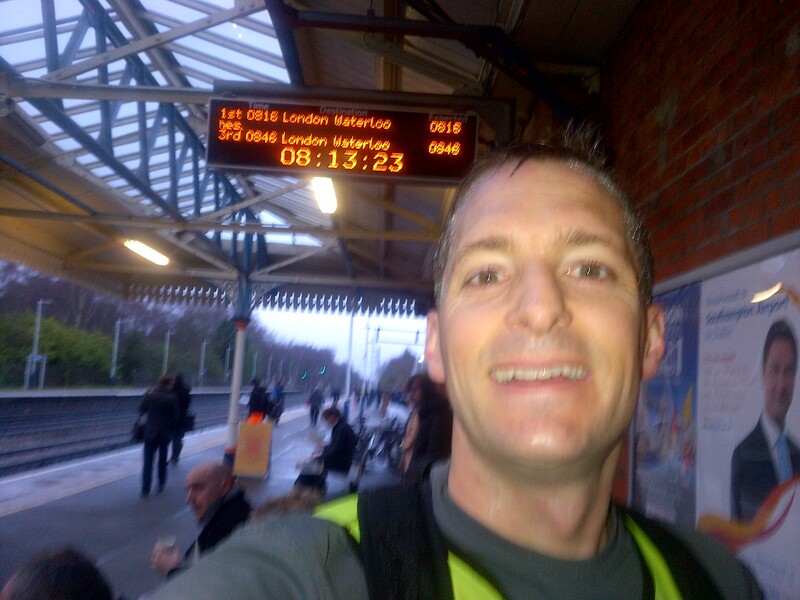 Today it was a jog from home to Farnborough Station followed by a trot to the office from Waterloo via London Bridge. At the end of the day, I jogged from the office to Waterloo and then home from Fleet Station. A total of 10.7miles in 1hr 29mins giving me a Janathon total of 248miles. Whoop whoop! Having enjoyed (read: endured) last week’s Wednesday morning trot to Brookwood Station, I decided to give it another go. This route has many redeeming features: (a) it is flat, (b) it is not road, (c) it is quiet, and (d) there is a bail out option of Ash Vale station at 8 miles. Last week I ran it in 1hr 43mins. Based on this time, working backwards I knew that if I left the house by 0630, I should make the 0816 to Waterloo. If I missed that train, there would be another one 14 minutes later. 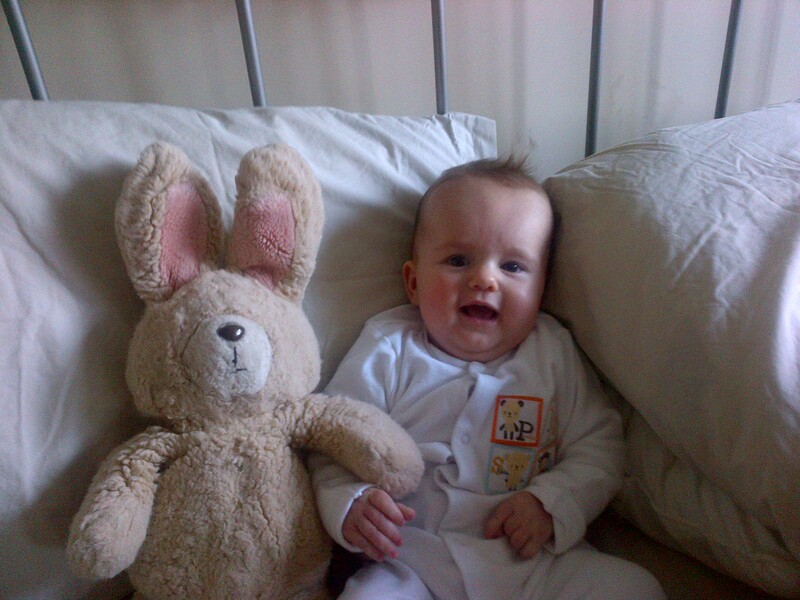 Both of which would ensure that I would be at my desk by 0930 showered and changed. There are two disadvantages of setting a target time for this run. 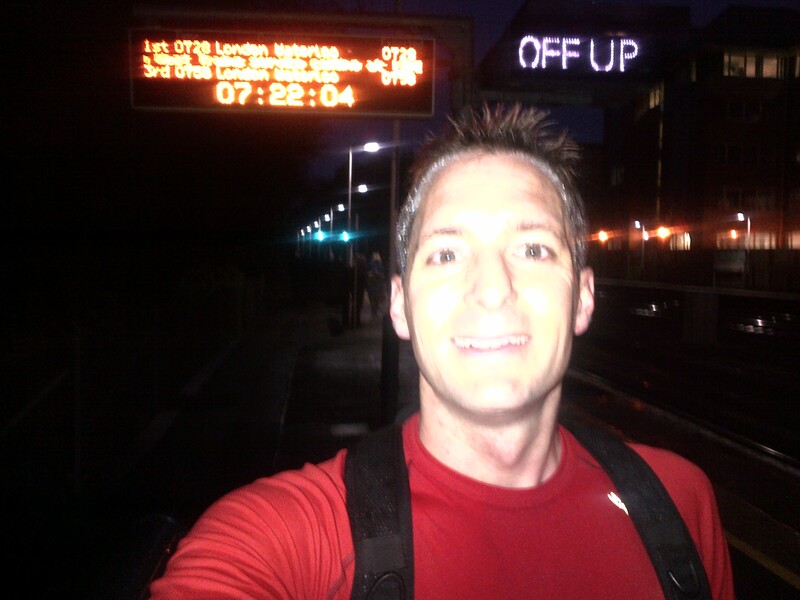 Firstly, 25 days into Janathon, the pressure of having to constantly push to catch a train is unwelcome. Secondly, conscious that I had to get up when my alarm went off at 0610 meant I slept terribly. Knowing you must get up does something funny to the body. I woke up every hour panicked that I had missed my alarm. Whilst 0610 is my normal alarm call, I usually allow myself two ten minute snoozes. I could have set my alarm for earlier but this would not have been at all fair on Mrs B. Furthermore, when I get up, regardless of how quiet I am, I somehow manage to wake up cherubean who then demands to be fed. Despite interrupted sleep, I did manage to get on my way reasonably punctually this morning. I am pleased that whilst chomping down a banana, I checked the outside temperature gauge which told me that I would be fine in shorts and T-shirt. The first couple of miles were good going. Whilst the morning drizzle reflected oddly on the beam of my headtorch, I made steady progress on a canal towpath which was well maintained and drained well. It was between Aldershot and Ash Vale that the conditions underfoot forced me to slow down. The rain from the previous day had left large puddles in my way and slippery off camber paths to traverse. From Ash Lock the conditions improved which coincided with me stowing away my headtorch. I was now on familiar territory having kayaked this stretch on numerous occasions previously. Getting my head down, I was able to make up some of the time lost and before long I was at the start of the Deepcut Flight, 10 miles into my run. Checking my Garmin, a quick calculation confirmed that if I could maintain my pace, I would make my train with a couple of minutes to spare. Pushing on, it was with great relief that the white cottage which marks the road into Brookwood came into sight. Leaving the tow path, as I neared the station, I was soon running past other commuters hurrying to catch the same train.